#Slytherin is the house of stubbornly completed dares that probably weren't thought through the whole way. 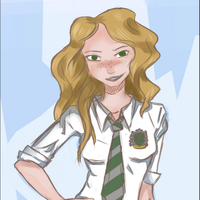 Diana Silvertome is a 17 year old, pureblood, Slytherin student. She has ash / dark blonde hair, forest green eyes, is 1.70 m and she tends to smirk a lot. Diana was born rather lucky. She was the only daughter of Egolistia and Fabulas Silvertome. The Silvertome family was well known. The deatheaters knew the name because Egolistia's side of the family was loyal to he-who-must-not-be-named and the normal people knew them because Fabulas was a really good guy. He had been a Ravenclaw and was now a wandmaker known for his kindness. Quite an odd couple indeed. It had been an arranged marriage which unfortunately occured rather often in pureblood families. Egolistia was one scary woman. She was very elegant, charming (like pureblood daughters were supposed to) but she was very cruel and cold on the inside. They had a total of three children including Adam. Egolistia had made sure that he was raised believing the same things she did: blood purity, prejudice, Slytherin, the dark lord etc. thus it was no surprise Adam became a deatheater at the age of 17. The second son, Christopher aKa Chris, was a lot like his father. He was kind and witty, generous and charming. He was sorted into Ravenclaw and Egolistia left him alone. The lastly came Diana. Diana Elisabeth Victoria Silvertome. She had been raised in both her mother and father's believes. She had gotten the 'proper' pureblood childhood; only hanging around with other pureblood kids, doing ballet, learning too many languages, attending way too many social events, wearing pretty dresses, having to watch her weight etc. etc. Diana however wasn't a bad person at all. She was insecure even tho nobody would ever know. Her mother was proud of her but always complained. Diana for example, has wavy/curly/wild hair and her mother never approved, she had a weird laugh, she was ticklish, she loved cookies too much, she loved rock music, she wanted a leather jacket etc. There was always something wrong with her. Diana had been raised in the after math of the dark lord's defeat. Deatheaters hung around her house and thus it wasn't weird that Diana developed huge trust issues which she would later in life still face. Diana could be considered a winter spirit. Some people, like Seamus, had a specific talent like for example fire. Diana had this with winter. She always felt better when it was snowing and she could somehow move the snow easier than others could. When Diana finally went to Hogwarts she was sorted into Slytherin and very happy to. She had always been friends with Blaise, Theo, Daphne, Pansy and Draco. They were a pretty close group of friends. At school Diana got the chance to be herself a bit more; she would prank people together with her friends, laugh all night, eat whatever she wanted, wear whatever she wanted etc. She became quick friends with for example Elena Periwinkle, a Gryffindor girl, who was soon enough her best friend. Siblings: Adam and Christopher Silvertome. Wand: Laurel wood with a Phoenix feather core 10 ¾" and Brittle flexibility with frost like figures carved into it. Hobbies: Diana absolutely LOVES winter and everything about it (snowangels, iceskating etc.). She enjoys to sing, read, eat cookies. She also enjoys being very sassy and is usually satisfied when she makes a great comment.